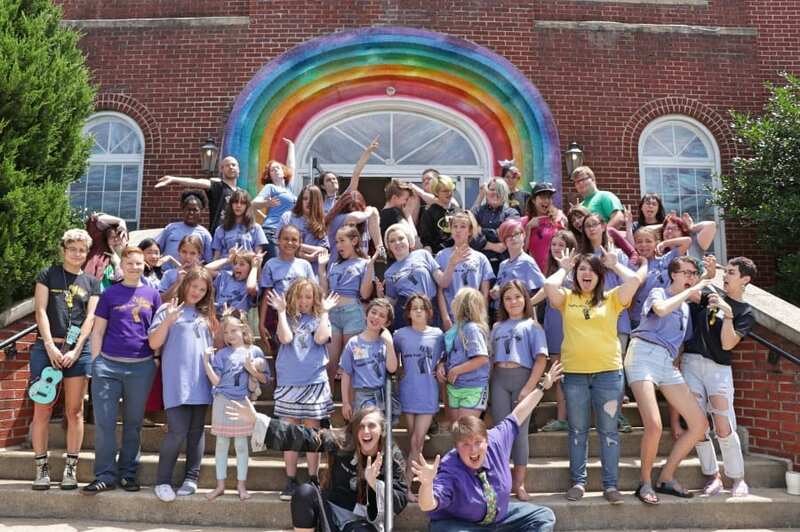 Summer Programming at Rainbow is an extension of what happens during the school year. Our camps focus on holistic approaches that appeal to all learners. From hands-on nature awareness, to cultivating video skills or learning about new cultures, there’s something for everyone. We have program offerings from Kindergarten through 8th grade. We also offer camps throughout the summer. 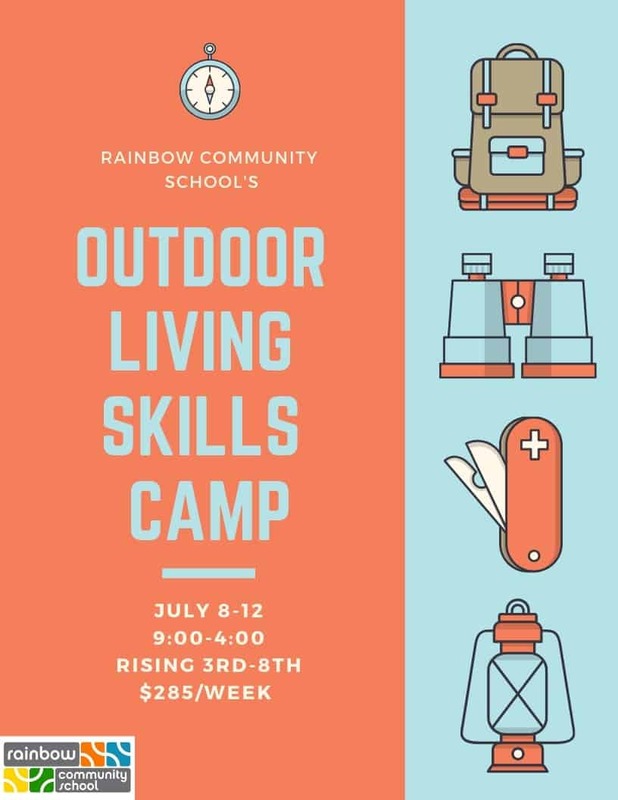 When applying, some camps are offered by Rainbow Community School teachers and staff. Others are offered by members of the Asheville Community. Be sure to click the registration button at the end of each camp to apply to the correct camp. We have limited scholarships available. We encourage you to inquire about availability by emailing our Camp Director, West Willmore. Camp Cost: $300 – includes composition books, writing instruments, art materials, and the cost of publishing journals at the end of camp. 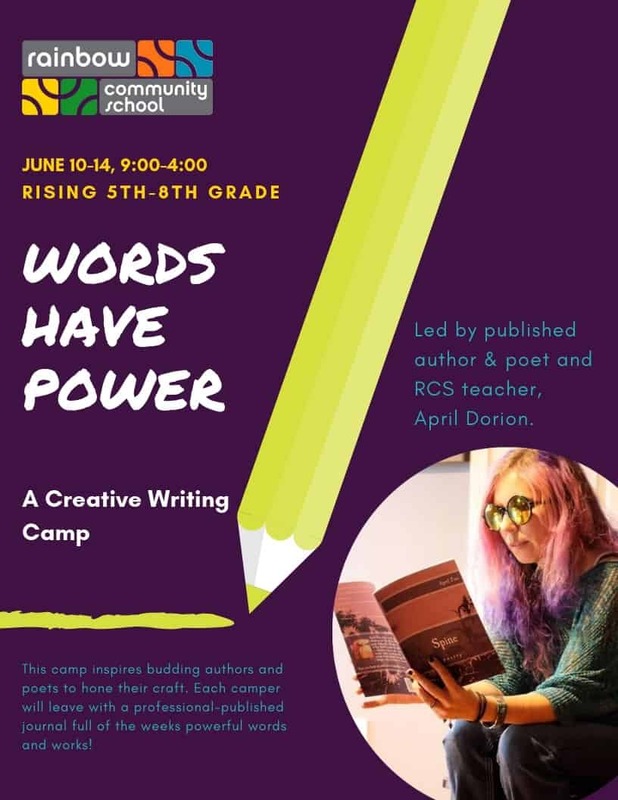 This camp is for rising 5th- through 8th-graders and combines the outdoor fun of a relaxed summertime with plenty of time for budding authors and poets to hone their craft. We’ll explore writers across a broad spectrum of genres, from classic authors and poets to modern songwriters. While spelling and grammar help will be offered as the campers go through the editing process, the focus will be on developing their own voices and studying the various ways that words can reflect and influence moods, emotions, society, and the world at large. After the close of camp, the young authors’ work will be compiled in professionally-published journals that they can keep and add to as they continue their writing journey. April Fox Dorion is Rainbow Community School’s 5th grade teacher assistant, as well as a published poet, author, and music journalist writing under her maiden name.She developed a love of words at an early age, and recognizes the power that they have: to reach others, as catharsis, to entertain, to educate, and to self-reflect. Her hope is to cultivate and encourage this love of writing in her young students and others in the community as they develop their own powerful voices. Camp Cost: $300 – includes materials and bus transportation. Join us for a week of Asheville Adventures! We live in one of the best cities in the world, and this week is dedicated to diving into the local history and taking time to show appreciation for what makes Asheville, Asheville. We will spend many of our mornings expanding our knowledge of the local arts, the geography, the haunted tales, and the pop culture that has been cultivated in our region. Our afternoons field trips will deepen our understanding of and allow us to have a first-hand experience with what we studied that morning. In these visits, we will find ways to share an appreciation for the person or space visited. Our final afternoon will be the creation of a What I Love about Asheville poster filled with pictures and artifacts from our adventures (and likely some local grub!). 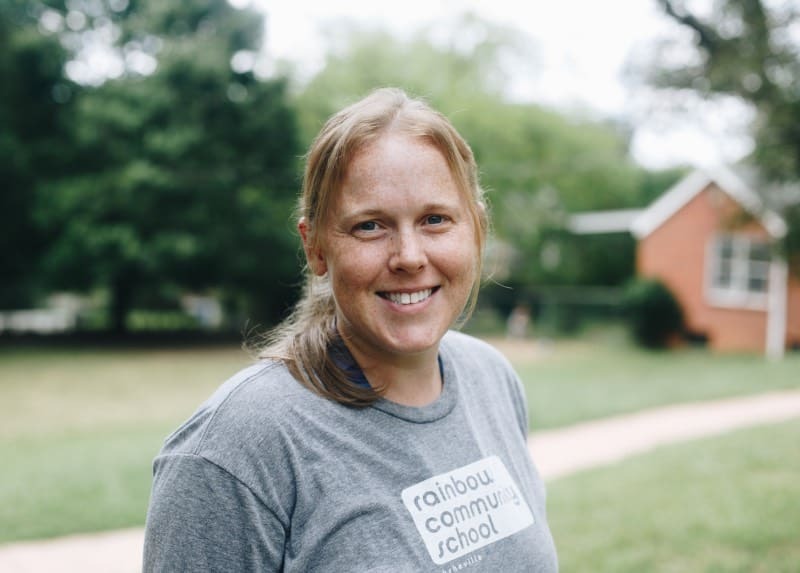 Susan moved the Asheville in 2006, which is also when she became one of the Omega teachers here at Rainbow. 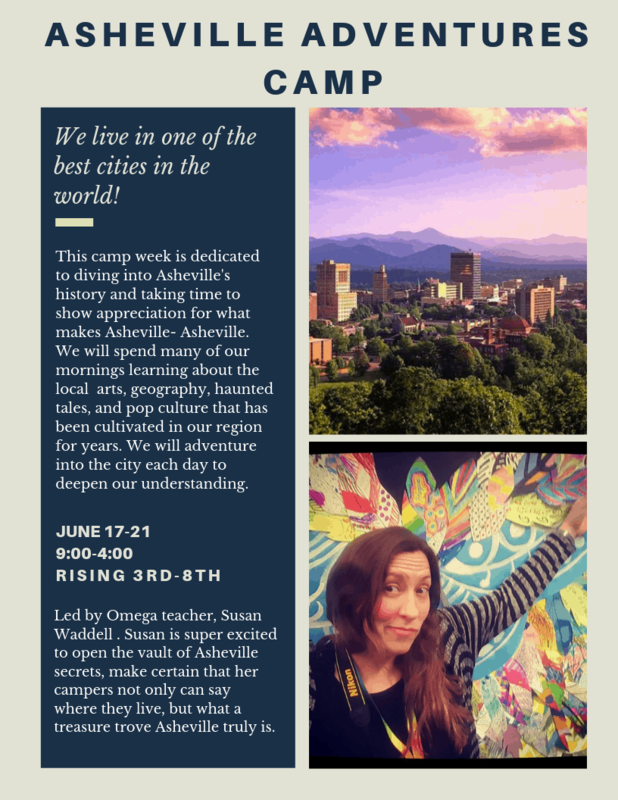 The first few summers, she and her husband, Chris, ran a camp they called CampChrusan: a week of Asheville adventures. They were filled with inspiration at every turn in this city and discovered the best way to experience Asheville was to be in it. From Art Strolls and local hikes, to trips to the Folk Art center and locations where haunted takes are set, they turned over all the stones they could in these camp days to get to know their new hometown. This camp ran for several years, and then Camp Chrusan went on pause so that Susan and Chris could raise their two children. In her spare time, Susan can be found knitting, playing with her family, doing all things Asheville, and falling more in love with this little town daily. Susan is super excited to open the vault of Asheville secrets, make certain that her campers not only can say where they live, but what a treasure trove Asheville truly is. Join us for a week of outdoor exploration and fun! Gain essential survival skills and outdoor living skills through stories, games, activities and skill-based challenges. You will learn to execute a one match fire, build a shelter with natural materials, orienteer using a map and compass, learn a variety of knots, explore our region’s wild edibles, learn a variety of ways to purify water and engage in many predator and prey games. West Willmore has, for 15 years, taught natural sciences and environmental education to children of all ages. Much of West’s own education took place in nature’s classroom where she studied the unique ecosystems of the Appalachian region and the southeastern Barrier Islands, the western United States, and New Zealand. West’s educational philosophy is anchored in place based and experiential learning. 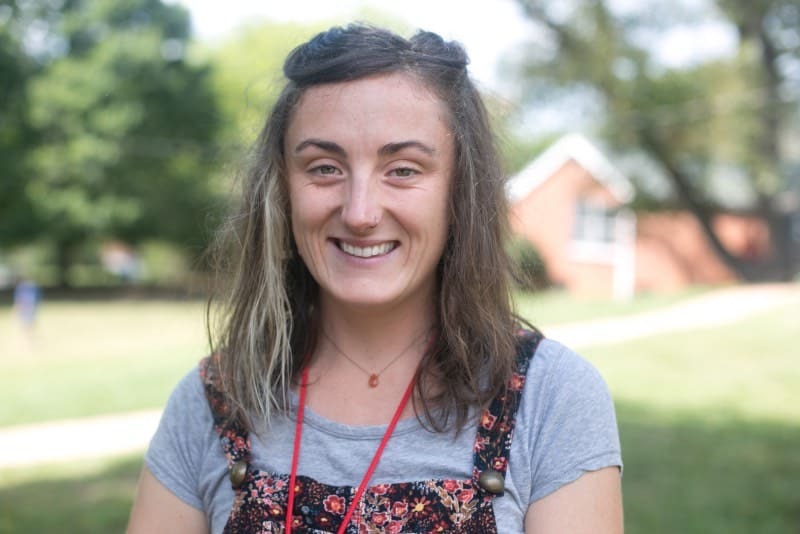 She works to nurture a love of learning by fostering in students deep connections to themselves, their community, and the natural world around them. 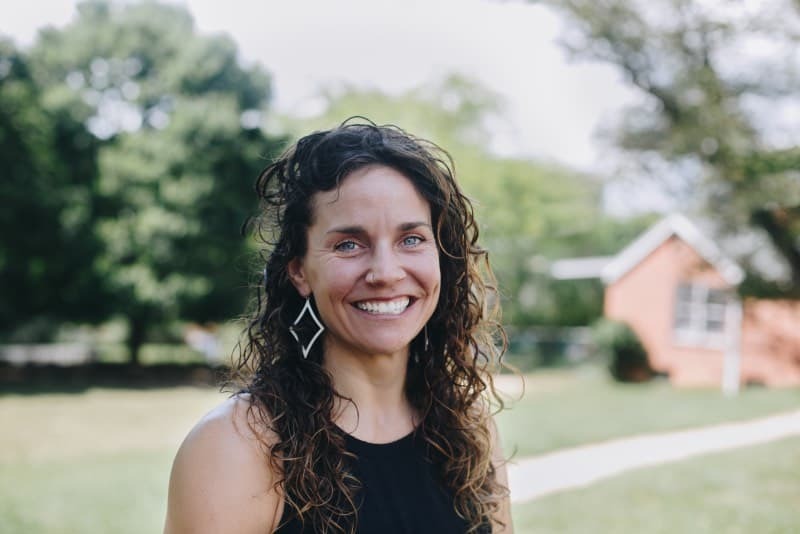 West holds a degree in Natural Resources and Environmental Studies, a graduate certificate in Environmental Education, a Master’s of Education and is a NC certified teacher and administrator. West is also an avid rock climber, trail runner, cyclist, and paddle boarder. Let’s take the opportunity deepen our connection to nature through play, exploration, and inquiry! We will spend the week exploring the nooks and crannies of Rainbow Community School’s five-acre nature oasis. 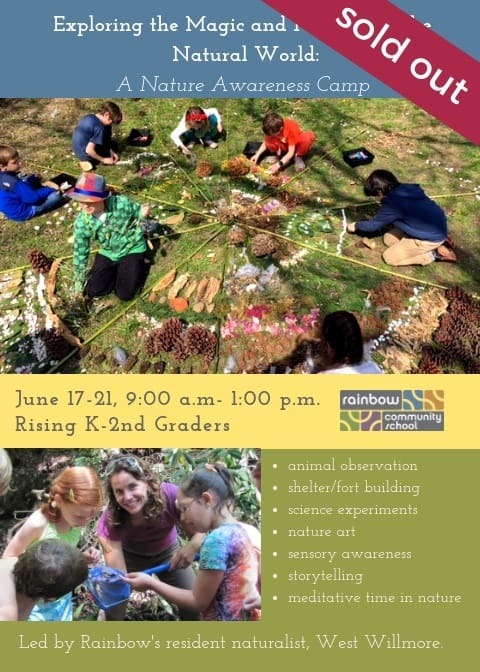 Time outside will be complete with animal observation, shelter/fort building, science experiments, nature art, sensory awareness activities, storytelling, quiet, meditative time in nature and gardening. West is not only a North Carolina certified teacher and administrator, but also holds a degree in Environmental Science and Natural Resources and a graduate certificate in Environmental Education. She has been working as a naturalist for over 15 years. West’s educational philosophy is anchored in place-based and experiential learning. 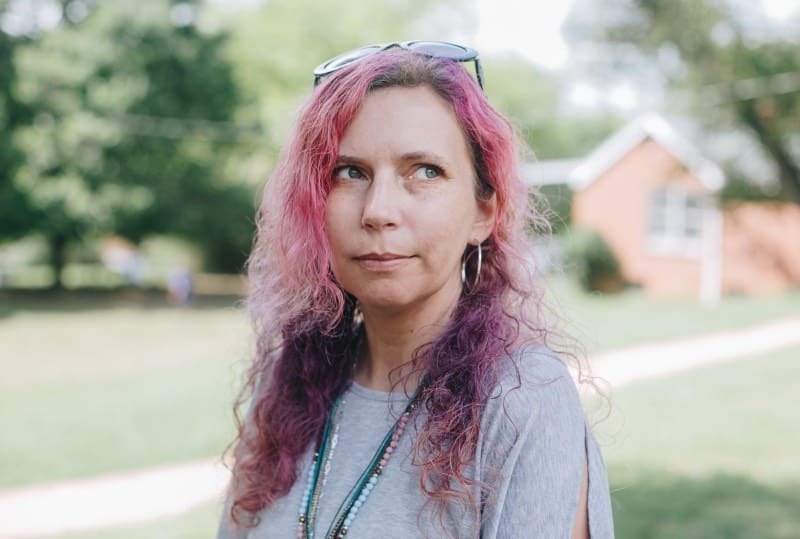 She works to nurture a love of learning by fostering in students deep connections to themselves, their community, and the natural world around them. Explore the many ways water affects our daily lives! Summer is a time for water play! 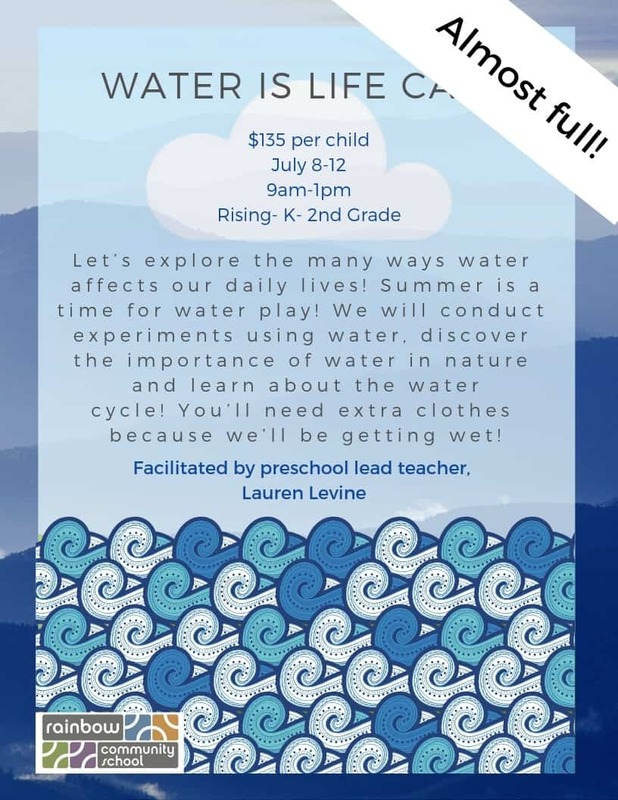 We will conduct experiments using water, discover the importance of water in nature and learn about the water cycle! You’ll need extra clothes because we’ll be getting wet! Lauren received a Bachelor’s degree in Zoology from Miami University, in Ohio, and a Master’s degree in Early Childhood Special Education from Concordia College, in New York. In 2014, she completed her AMS certified Montessori training from West Side Montessori School in NYC. Lauren began her teaching career five years ago while living in New York City. As a Montessori- kid herself, she was immediately drawn to Montessori education. She was fortunate to work and train alongside many amazing early childhood Montessori teachers at West Side Montessori School. Her training not only developed her knowledge and understanding of the Montessori Method, but also provided experience in “best practices” in early childhood education. Incorporating Montessori principles with modern approaches in education develops a strong method that addresses the needs of the individual child. Lauren feels inspired and motivated by the teachers, staff and community. Lauren was drawn to the school’s progressive educational model and goals. She is looking forward to continuing her professional development by focusing on the fundamentals in mindfulness education. Outside of the classroom, Lauren enjoys spending time with her growing family and pets! She loves gardening, hiking and simply relaxing!! Join us as we step into the worlds of Claude Monet, Georgia O’Keeffe, and other famous artists. Together we will discover how they used nature for inspiration! 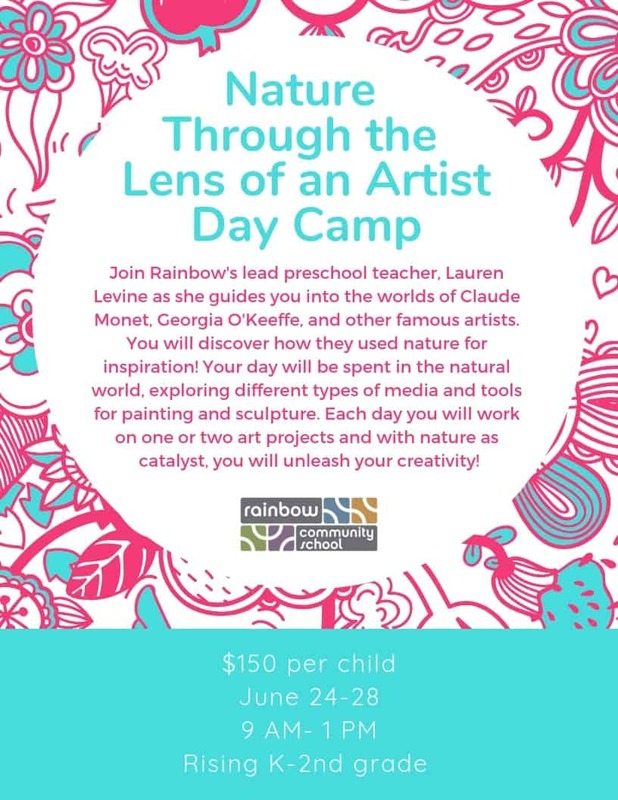 We’ll spend the day in the natural world, exploring different types of art media and tools to make paintings and sculptures. Each day we will work on one or two projects; with nature as our catalyst, we will unleash your creativity! June 24-28, 9:00-4:00, For gender minorities and girls ages 8-16. 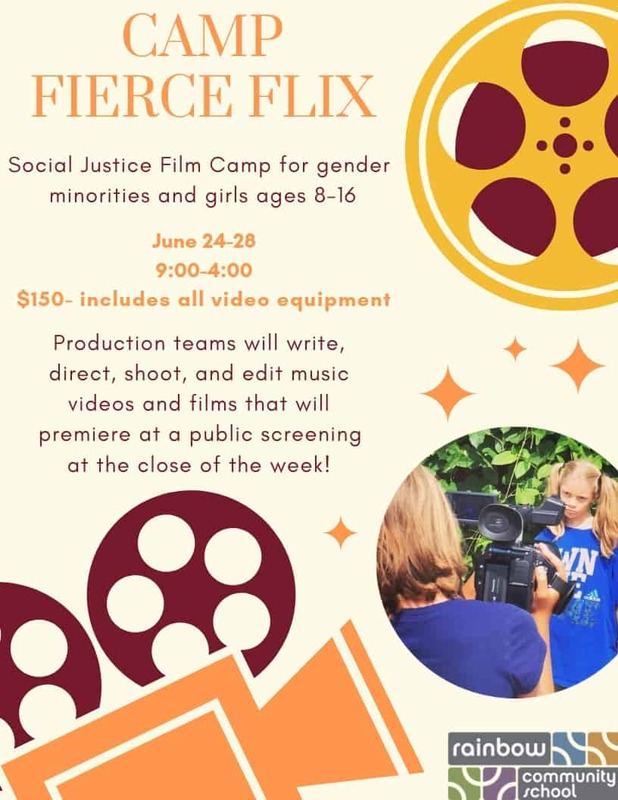 Fierce Flix is a social justice film camp for gender minorities and girls ages 8-16. Over the course of a week, campers will form production teams, and write, direct, shoot, and edit music videos for local bands! The music videos will premiere as a public screening at a movie theatre at the end of camp. Each day, campers will attend video shoots, filmmaking instruction, workshops, and a mini-screening & talkback with a filmmaker from a marginalized gender group. Throughout the week, campers are encouraged to work together, support each other, and foster one another’s unique creative abilities through positive reinforcement. Women are significantly under-represented in film production – 9% of directors, 2% of cinematographers and 15% of writers are women. On screen, only 30.8% of speaking characters are women. WE hope to empower the next generation of makers to change this. Fierce Flix is a volunteer-run non-profit camp. Our volunteers are filmmakers, artists, educators, parents, activists, and community members dedicated to empowering youth. 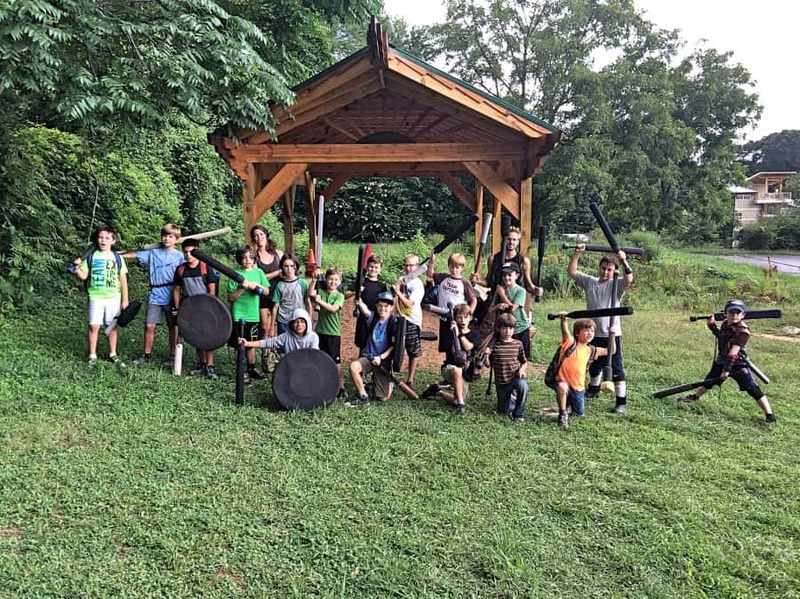 This camp teaches children ages 9-15 how to be a modern day warrior that deeply values peace, compassion, and respect for themselves and their opponents. 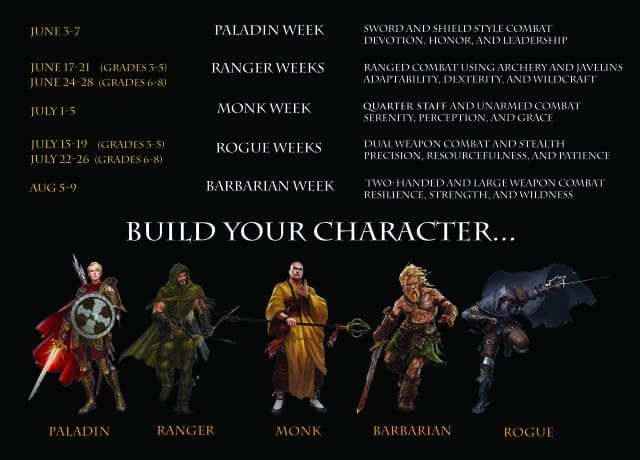 Each week will include large amounts of boffer game play using all different kinds of gear, and we will focus on studying the style of one warrior archetype and honing the abilities that they utilize in the game and the rest of life! The mornings will be more physically active, focusing on game play and ability training. The afternoons will be less physically demanding during the heat of the day, with time and activities focused on learning how to become our own unique versions of the warrior archetype for the week. Week of the Paladin: Specializing in sword and shield style combat, the Paladin is a warrior that embodies Devotion, Honor, and Leadership. Week of the Ranger: Specializing in ranged combat using archery and javelins, the Ranger is a warrior that embodies Adaptability, Dexterity, and Wildcraft. Week of the Monk: Specializing in staff and unarmed combat, the Monk is a warrior that embodies Serenity, Perception, and Grace. Week of the Rogue: Specializing in dual weapon combat and stealth, the Rogue is a warrior that embodies Precision, Resourcefulness, and Patience. Week of the Barbarian: Specializing in two-handed and large weapon combat, the Barbarian is a warrior that embodies Resilience, Strength, and Wildness. Phil Ferguson is the leader of The Wandering Swordsmen, an organization dedicated to the facilitation and growth of padded full contact combat sports, also known as boffing. 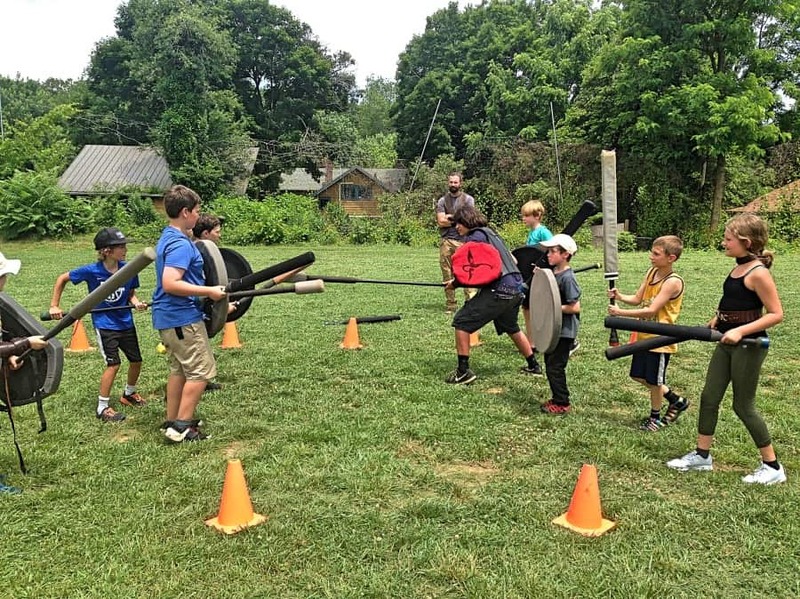 He started training in boffer swordplay in 2006, started the Asheville team and community in 2011, and has been teaching professionally since February 2014. Currently he teaches at many schools and festivals around Asheville, as well as weekly by donation at Carrier Park on Sundays, and travels to national events to compete numerous times throughout the year. His goal is to travel the world with The Wandering Swordsmen to help professionalize the sport, while using his training methods to teach people how to engage in compassionate combat, and by doing so help humanity learn how to resolve conflict more effectively. 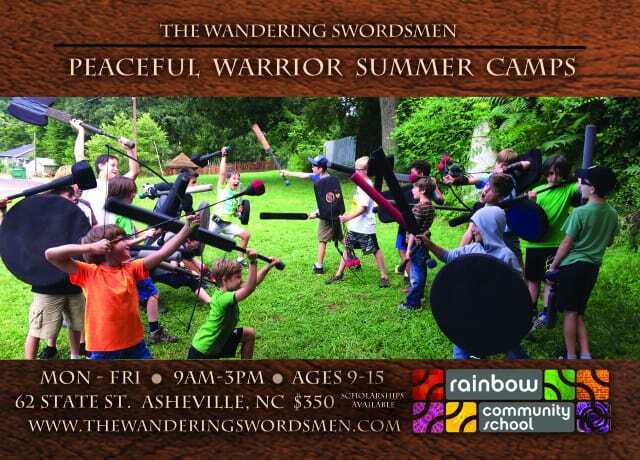 Email Phil Ferguson at thewanderingswordsmenllc@gmail.com to register for this camp. Throughout July and August, Visions USA welcomes students from Europe and Asia to visit the US! Local families can participate in the multicultural fun by either hosting an international student for 2 to 4 weeks, or attending Day Camp alongside students from countries such as Germany, Cambodia, and Spain! Students will have the opportunity to learn a foreign language (language options depend on the nationalities of our visiting students, on a week by week rotation throughout the summer, in an attempt to offer as many languages as our visiting students speak), participate in local service projects, and activities such as White Water Rafting, Carrowinds, and more! If you decide to host, we offer one free week of day camp for American host siblings. However, you don’t have to host to take advantage of our summer day camp. Visions USA is an ESL immersion program in Asheville, with students visiting April 15-27th, our visiting students participate in English classes a few mornings a week, and explore what Asheville has to offer during the afternoons, from hiking to waterfalls, volunteering with local organizations like Manna food bank and Conserving Carolina, games and more. Visiting students also have the chance to participate in full day programming at local Asheville schools. The goal is to get a fully comprehensive experience of what Asheville has to offer, from exploring and enjoying our amazing local wilderness, engaging in typical team-building American camp games and activities, and giving back to the community through service. It’s a wonderful opportunity for mutually beneficial cultural exchange: our exchange students and their host siblings learn so much about language and culture from one another, and often form lasting life-long friendships. Each year since we first welcomed international students we have been surprised and satisfied to observe the instant connections between the visiting students and their host families. Hi, I’m Katie! I grew up in Asheville, graduated from Appalachian State University, and have taught in WNC for the last 8 years. Throughout my teaching career, I have taught everything from Spanish to Yoga, and across all ages, from PreK through highschool. I have worked in a variety of roles at RCS for the past 3 years. I absolutely love the RCS community and am thrilled to be able to bring this opportunity for multicultural learning to our students and families. Looking for something meaningful to get your family involved in? Maybe you’ve always wanted to travel abroad with your family, but this year the timing just doesn’t work out. 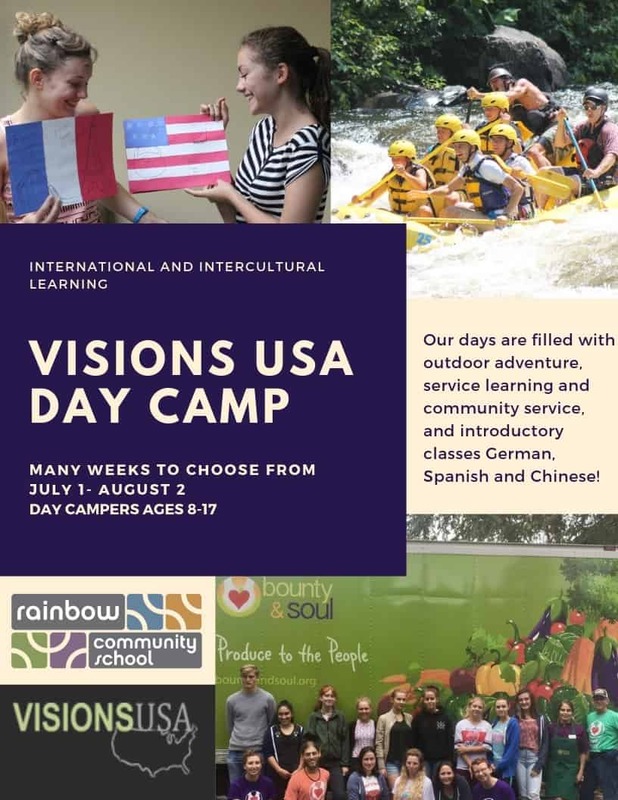 Visions USA runs short-term school year programs and all summer long as a home-stay program for students from Spain, Germany, China, even Cambodia, and YOU can host one of our visiting students! Why not bring the vacation to your home, and try a little bit of cultural exchange for your family! Contact Director Katie Wilson at Katie.wilson@visionsusa.org with questions.